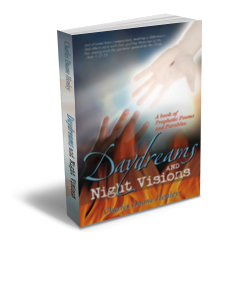 From author Charles Duane Henley comes his first release, “Daydreams and Night Visions” a unique and powerful collection of prophetic poems and parables intertwined with the author’s personal amazing testimony. These Holy Spirit inspired writings will set your heart ablaze for Christ. Poignant and powerful these writings and poems cut to the heart and ignite passion in the soul for the One who is the lover of your soul, Jesus Christ. It is the author’s intent and hope that all come to know the depth and width of the love of God and come to understand, in a deeper, more intimate and personal way what Christ did for mankind on the Cross of Calvary. Experience the heart felt passion of this author who came from a life of sin, and as the Prodigal Son did, came running back into the arms of his loving Father in Heaven. Leaving a legacy of beautifully written and Holy Spirit inspired prophetic poems, the author’s purpose and intent in penning this book is that anyone who reads this book will be inspired to make a choice for Christ. Knowing that time is short, and today is the day of salvation, the author wants everyone to know the freedom, love and forgiveness found in Jesus Christ and that there is nothing more important in this world than making sure that you don’t spend an eternity without God. The author candidly shares his life experience as a child once on fire for God, who ran astray as most people do. He found himself years later on a road called despair, which he has eloquently penned a poem of. All of the author’s writings come from the inner heart and are vivid poems of his life, trials, tribulations, hopes and dreams. They display the absolute love and forgiveness found in the Lamb of God, Jesus Christ. All glory is given to his Father in Heaven as the author recounts some of his hardest times being imprisoned, bound physically in the flesh, but speaks of the joy and freedom he experiences in his spirit being taught and groomed by the Lord during this period. Out of his “pit” experience comes a beautiful testimony to the love and grace of God. These poems are poignant, sometimes convicting and simple, yet scriptural and profound truths found in the Word of God. This book is a creative and truly inspiring life story that will open your eyes to the possibilities in Christ despite great adversities. This encouraging, faith filled invaluable book of prophetic poems is sure to ignite a passion in other’s souls for a life with Christ. For further information visit Author Charles Duane Henley’s web site Daydreams and Night Visions. ~ by inhisgloriousname on January 7, 2012.